New York Muffins has a great selection of healthy juices, smoothies, bagels (includes the classic PB&J), salads (create your own), sandwiches, and wraps. People definitely like to get their heath fix here with their juices, which include carrot, apple, ginger combos and the scary Green Juice with kale. Some of their juice names includes "Hangover Helper," "Skin Cleanser," "Morning Energizer," "Tropical Rush." Their "Cold Cure" includes broccoli, carrot, ginger, and echinacea. They also supposedly have fantastic coffee, notably iced coffee, although we haven't tried that yet - too busy trying their juice and smoothie. 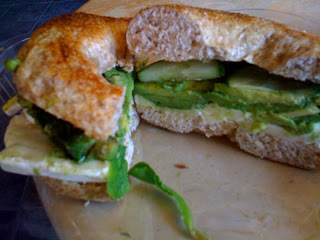 Their avocado and brie sandwich on whole wheat bagel. Some avocado combo sandwiches barely come with any avocado. This sandwich is loaded with the healthy, fatty fruit. The sandwiches are all served with a hefty salad portion. 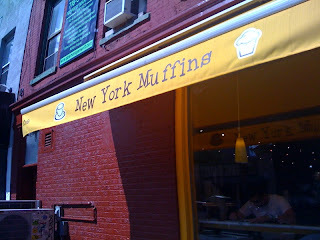 Oddly, considering their name, their selection of muffins aren't as great. 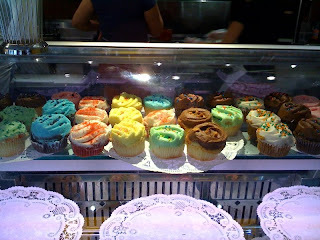 But check out their cupcakes! We'll have the blue one, the green one, the yellow one, in that order.